Shelby Bromac put a disappointing performance in the heats behind him to win the $75,000 Tasmania Cup harness racing final in Hobart on Saturday night. 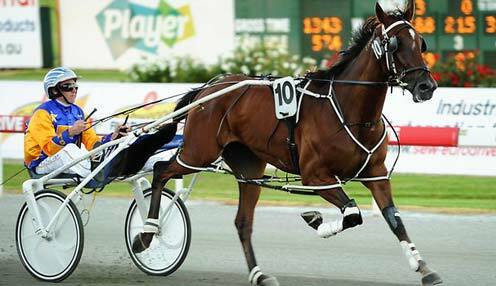 The former Kiwi Pacer had been unbeaten in Australia until he missed a place in his Tasmania Cup heat in a performance that Frenning said left connections "scratching our heads." Thankfully after making one or two gear changes, and changing tactics, he bounced back in style on Saturday night. Now trained in Victoria by David Aiken, Shelby Bromac was confidently driven by Kima Frenning to land a decisive victory over War Dan and Star Chamber. Shelby Bromac was no doubt boosted by the fact that hot fancies Sicario and Scooterwillrev both missed the start and took virtually no part in the race. Elsewhere, Harjeet also faded after a torrid run. Shelby Bromac still put in a fine display to take the win, much to the delight of his junior reinswoman. "We made a few gear changes and, because he didn't pace great last week, I drove him aggressively tonight to find the fence," Frenning said. Meanwhile, Max Delight gave Aiken a feature double when he made light work of the $30,000 Tasmanian Derby. Elsewhere on the night, Enchanted Stride won the $30,000 Tasmanian Oaks, while class mare Call Her Julie outstayed her rivals to win the $20,000 George Johnson.